Situated on the 3rd Street that dictates its name, this thriving, professional gym is located just off San Francisco’s Dogpatch neighborhood. Even though the Dogpatch is now a little more gentrified, the gym offers a stark return to a steely past. The owner is Paul Wade, an Irishman who moved to the San Francisco area in 1993. Wade has made use of his own amateur boxing experience to help train amateur and professional boxers as well as branching out into expert fitness training and even pushing some A-list celebrities through their paces over the years. Wade places an emphasis not just on the physical benefits of the sport but also on the mental and de-stressing qualities of such an intense, physical workout. Boxing is not just a strict regimen, either, but at the base level it should be a fun activity, designed for learning self-defense techniques but also maintaining focus, discipline and coordination. 3rd Street realizes and espouses these core values. The club boasts a strong roster of qualified, talented coaches all operating under the tutelage of Wade. Lenny Albert is a master of the fundamentals and acted as somewhat of a mentor to Wade in the early days of his stateside boxing journey. Australian Danielle Midalia and Ireland’s Lewis Johnston add to a strong international flavor. Former amateur Dave Teran is USA boxing and California athletic commission certified. Copious online reviews laud the clean, fresh and modern approach to training in the gym, which caters for newcomers and those looking to be groomed into well-rounded professional pugilists. Even though the space can get relatively packed out at peak times there are numerous punching bags, two rings, weights and plenty of room to accommodate everyone. Weight loss is a key area of expertise with many users dropping the pounds while on regular, structured programs. “Health enthusiasts and newbies are welcome to explore the warrior within them. A total workout: mind, body and spirit – at Third Street Gym – you will be assured of a sound mind and a sound body,” says regular member Anna Tanato. 3rd street runs occasional amateur boxing nights as well which allows Wade to keep in touch with his combat roots. Current welterweight contender Karim ‘Hard Hitta’ Mayfield trains out of the gym under the guidance of his trainer Ben Bautista. The gym runs an app that allows users to book classes, personal training and boot camps by syncing events with personal calendars. Like many gyms, a “Ten Commandments” helps to keep things running smoothly. 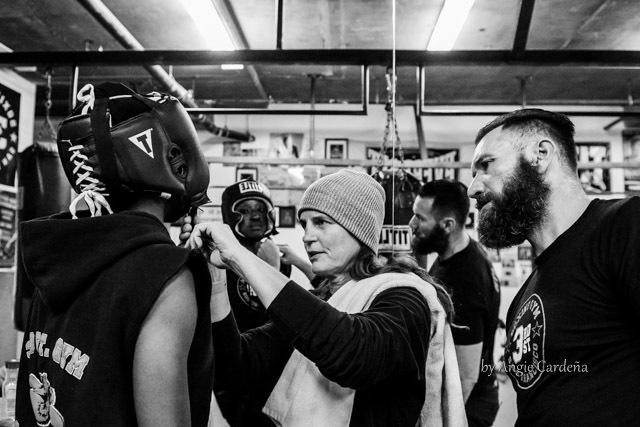 While 3rd Street is the standout facility, San Francisco has plenty of other boxing gyms of interest for boxers and fitness enthusiasts to explore. The dual location HIT Fit gym (Mission District & Nob Hill) has a mission to provide high intensity training and is run by Simon Redmond who actually helped co-found the original 3rd Street club before moving on to open another facility and eventually developing the HIT Fit brand. Run by David Park the Park Gym offers an attractive five class package that may serve to entice customers who are looking for an intense workout. Users speak of the impressive motivational skills of Park, who once trained under Freddie Roach and alongside world champion Brian Viloria. Head boxing coach Austin Tam puts users through their paces under his training regimes that include a 60-minute BoxFit workout that blends strength, conditioning and skill training. There is a strong emphasis on sparring and perfecting rote moves and combinations and using them in a controlled combat environment. The word that constantly comes up when describing San Francisco’s Rise Combat Sports (formerly Fight and Fitness) is “challenging” and current members warn newbies not to come along unmotivated! Even though the name has changed, the trainers and foundations remain in place. The brainchild of Chris Cariaso and Thai-born Bunkerd Faphimai, the gym focuses a lot on the wider scope of combat sports, with classes in wrestling, Muay Thai, Gi Jiu-Jitsu all running alongside a solid program of traditional boxing. The El Niño Training Center is also situated in the Dogpatch area, close to 3rd Street. Focusing more around the MMA and combat side of things, boxing does play a key role in their instruction program due to its use in “striking”. One total beginner stayed around long after his introductory class, due to the warm, easy going vibe and top notch instruction available. ← James Shuler Boxing Gym – Is It The Best In Philadelphia?